South Shore Paving has been a trusted paving contractor in Bound Brook, New Jersey for nearly a decade and a half. During that time, we have set an industry standard for craftsmanship, efficiency, and customer satisfaction. With the customer as a top priority, we are ready to assist you on your next asphalt or concrete project. We recently received a call from a client who was looking for parking lot paving in Bound Brook. The client was in the process of developing a new residential area. Many of the houses were nearing completion, and they were gearing up for asphalt paving. He explained that he had reached out to a few other paving contractors in the area. However, he had been unsatisfied with them. We told him that he had contacted the right asphalt company. Our team visited the new residential complex in order to completely evaluate the project. We needed to examine the project needs, in order to determine the entire scope of the project. We decided that a completely new parking lot installation was required. The new construction began with the excavation of the paving area. That was followed by removal of excess materials. Finally, we graded the location to establish a proper grade. Our team laid the aggregate base material, which was then compacted to appropriate and desired depth. The asphalt paving surface was finally applied to the parking lot. We applied a layer of sealant to the lot to keep our unwanted foreign objects, hazardous chemicals, oils, and liquids. At the completion of the residential neighborhood parking lot and roads, the complex looked amazing. The property manager and developer were very pleased with our work. 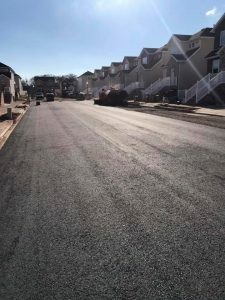 They thanked us for our expert asphalt paving services and told us they would be calling the best asphalt company in Bound Brook with any further asphalt or concrete needs.